An action adventure game based on the license of the animated movie series How to Train a Dragon. In Dragons: Dawn of New Riders, players take control of the researcher Scribbler and his dragon Patch, who are trying to stop the sinister Eira. Dragons: Dawn of New Riders is an action adventure game based on a license of a popular series of animated films How to Train a Dragon. The production was developed by the Climax Studios team and was released by Outright Games. The story told in Dragons: Dawn of New Riders begins when the island of Havenholme is attacked by the sinister Eira. Two of the main characters, Scribbler, who suffers from amnesia, and Patch, a unique chimeragon dragon who wields previously unknown powers, can face him. Not only do we try to prevent Eira from capturing Patch, but we also try to solve Scribbler's past and develop his friendship with Patch. In Dragons: Dawn of New Riders we alternately control Scribbler and his dragon Patch. Watching the action from a top-down perspective, we travel through different locations, fight with encountered opponents (both dragon hunters and other, sometimes powerful reptiles stand in our way), as well as solve environmental riddles and free up the dragons we have captured. As we progress, we unlock Patch's hidden skills, so we can face more and more challenges over time. In the game there is a place both for locations known from the film's original (such as Valka's Mountain), as well as for completely new places, like Blood Briar Island. There are also characters known for their large screen, such as Hiccup, Astrid and the dragon Gobber. 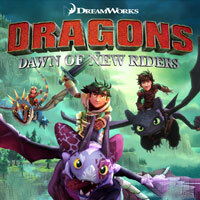 Dragons: Dawn of New Riders has colourful, three-dimensional graphics in a style reminiscent of the cinema's original.